What We Offer / What is a Service? Our technician puts the vehicle on the hoist. The used oil, which is drained from the engine is stored in an environmentally friendly waste oil system before collection for recycling. An underbody inspection ensures various elements, such as the suspension and steering are in good working order. Our technician will grease the drive shaft and ball joints where applicable. Tyre pressures are checked including the spare wheel, and corrected if necessary. Tyres are rotated front to rear, when necessary to keep wear even. A visual inspection of the brake pads and rotors is an important part of a service. We fit a new oil filter of the correct application to your car. This is important for maximum engine protection of performance of your car. Fresh FUCHS oil goes into the engine. Our technician inspects under the bonnet checking the drive belts, hoses and cooling system for any sign of leaks or loose connections. The air filter is cleaned or replaced. Our technician tops up fluid levels such as brake, clutch, transmission, windscreen washer, battery, and power steering where necessary. Our technician examines the exhaust system for leaks and damage. Each door has its hinges lubed, to prevent annoying squeaks. 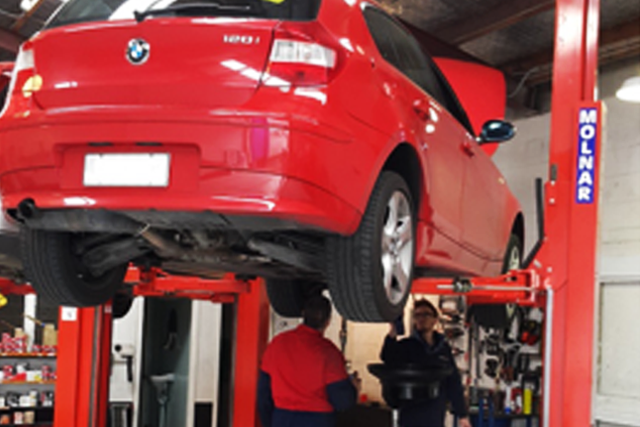 Our technician will run a full diagnostics scan on the vehicle to check any faults that may be an issue and advise you of the status and any remedial work required. Finally a road test is carried out to ensure your vehicle is running smoothly before handing back to you for the next 10,000 km of motoring.